You wear the mommy outfit! Umm…yes honey, I do. But if anything, I’ve taken it a step down from most mom’s. You mean, you know about the mommy outfit? Yup. My mummy outfit consists of leggings, t-shirt and hoodie, matched with flat shoes (or slippers if I’m at home). In the summer there are 2 slight variations – sandals, not shoes and short/capri leggings. And maybe once a month, I dress up an put on real jeans. Even most of my work clothing now consists of outfits I can partner with flat shoes. Honestly, I think in 2017 I can count the times I’ve worn heels on my fingers, possibly even on one hand. But, I’ve taken it a step down, because I work from home so there are truly days where I don’t get out of my pajama’s (But I always shower, we have a rule about that in the MPB household). I live for comfortable clothing right now. If I’m working at my desk and not leaving the house, pajama’s it is. If I’m hanging out with Little MPB, leggings are basically the most practical article of clothing ever for chasing a very active toddler. And so, I accept the mommy outfit with pride and delight. If my clothing choice marks me as a mommy in public, I’m okay with that. I will wear the label of mommy with pride, and rejoice in the fact that I even get to be a mommy! I wear a lot of sweats because I’m hating my legs in leggings right now. Too much weight gain this first year of mommy hood. 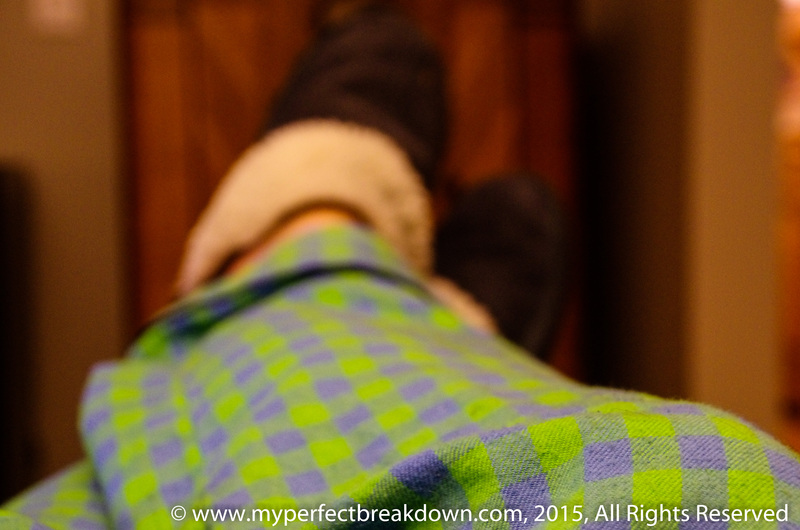 And there are days I also don’t get out of pj’s…especially in the winter. If it’s not comfortable, I’m not wearing it. End of story. I’ve worn the ‘mommy’ outfit my whole life, really! Me too! Like why do I need to dress up to be covered in food and spit up and dirt and whatever else we get into. I’m actually looking forward to the cooler weather so I can wear jeans if I want but other than that I need things that are comfortable! Also I haven’t blown dried or straightened my hair since July! This is crazy since it’s something I did most days when I worked. Way to go! Wear that mommy outfit with pride! My wife has kindly made requests that I sometimes wear something nicer, but so often “nicer” means less comfortable! And when you’re crawling around the floor with a baby or kid, comfortable is where it’s at! You be you, mama. I love the Mommy outfit. My identical twin is super fashionable so occasionally I am inspired to actually get ready but usually you can find me in yoga clothes (most likely never having done yoga😀). Nothing wrong with that! I do wear shorts and tanks or t-shirts in the summer, but when it gets cold I’m sure I’ll just break out the leggings as well!! We have to run after crazy minions, we need flexible clothes! me too! i work from home a few days a week…so on those days i’m definitely in my sweats and hoodies! I just don’t find jeans that comfortable when i’m running around after my kids! I love the mommy outfit! My husband just rolls his eyes at me when he sees me emerge from the bedroom wearing a tank top and super baggy sweatpants. What I consider my greatest success is finding a way, in the winter, to wear leggings to work at the office. Knee high flat boots, leggings and long sweaters/cardigans means still being office friendly but with the mommy outfit level of comfort! Umm so I don’t have kids yet, but wear the Mummy outfit. In fact I have since not long after my nephew was born. More than that I generally have an outfit change in my car just in case of bodily fluids LOL. Between my friends kids and my own nephews and nieces I feel as though I have been given a great introduction into what I should expect everyday with kids. Basically I always have a gym bag with emergency toiletries and change of clothes which can be used for the gym or as a rescue from a vomit laden outfit hahaha. I’m the same, sometimes I make myself get dressed up as in jeans and a t-shirt that isn’t 10 times too big. Most days I just don’t have the energy.